It was supposed to be a one-off project, yet time and time again I had been asked if there was a possibility to make another one. It seems access to woodworking lathes is rather limited, which in hindsight should come as no surprise. I mean if you don’t have a lathe yourself, how do you even find someone who does? Plus, using one isn’t that straightforward either. Until recently one determined lass managed to bribe, I mean convince me to bring this project back to life. The catch this time is now that I have my very own 3D printer I’ll be allowed to make the whole thing 3D printable, though mixed media or complete wood reconstruction is, of course, still possible for anyone who wants to do so. I think that access to 3D printers or 3D printing services ought to be far better than the woodworking lathe supply, so I might actually lay this to rest for good this time. Generally speaking, when recreating a prop or using it as an inspiration, getting as much high-quality reference material on it as possible is a tremendous help. As I am mostly copying myself / the previous iteration of this project and as I am a data hoarder I still have all the necessary material safely stored on a hard drive. 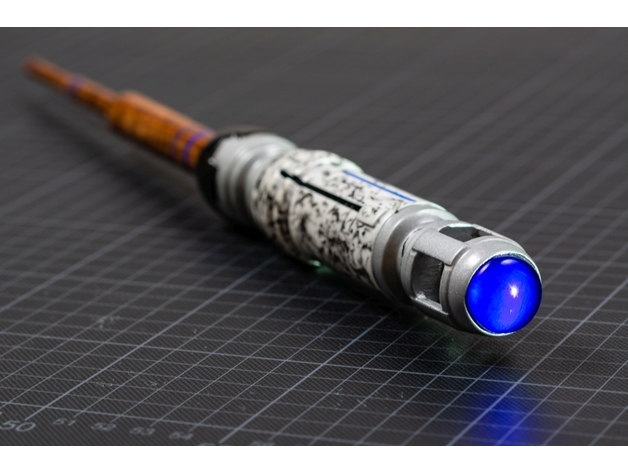 Additionally I have procured some rather decent pictures from a production-used Sonic Screwdriver from Doctor Who episode “The Day of the Doctor” thanks to a tbt Props sale as well as from a high-quality replica by The Celestial Toystore. What do you want from CircuitPython in 2019?